COPE Sensitive Freight is an Australian freight specialist that offers an end-to-end solution, with dedicated account and project management teams, clear communication, right-fit solutions and quality control at every stage of delivery. We are your trusted advisors for complex freight movements. Our attention to detail, level of care for the product and onsite experience delivered to your customers provides assurance that you’re in safe hands. Our team are licenced to perform high-risk work including dogging, rigging and working at heights. Our project managers have First Aid certificates and we have licences to store, transport and install specialised freight. Our team will work with you to develop standard operating procedures, training requirements and milestones, supported by a working party of industry experts who will coordinate all activities and be available on site as required. We don’t leave anything to chance, creating detailed plans and processes to ensure a smooth transition. COPE Sensitive Freight can also provide distribution management services, to coordinate deliveries on your behalf. Our strong relationships with customers means you’ll enjoy improved planning and access to decision makers. Our national network of 14 depots provide short and long-term storage for sensitive freight, with the option of standard pallet racking or bulk floor storage space depending on your needs. Each warehouse is well maintained and secure, with CCTV and security at every site. We also provide reporting software that keeps track of your inventory and a dedicated space for our trained technicians to assemble your equipment. As Australian freight specialists, we manage all aspects of warehousing, including container management, pallet consolidation, specialist packing, stocktake, calibration and specialised storage of high-value equipment. We have a modern fleet of more than 350 trucks and trailers across Australia, each designed to transport sensitive freight to commercial and residential sites according to the specifications of our clients. Our trucks and trailers feature hydraulic tailgates, air ride suspension, anti-skid floors, internal padded rub rails and mechanisms for keeping your freight completely secure at all times. Our vehicles all comply with the relevant transport requirements in each state and are covered by a stringent regulatory service and maintenance program. 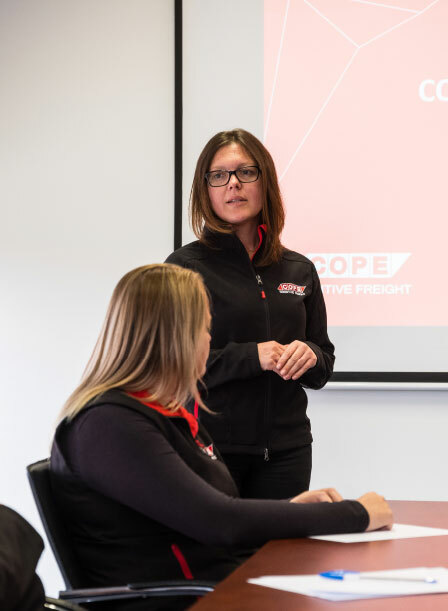 COPE Sensitive Freight has a culture of continuous improvement, which means we’re always looking for ways to improve the quality and efficiency of our service without compromising safety or compliance. Through ongoing reporting and review of key performance indicators (KPIs), we look at your logistics from a holistic perspective and identify areas where we can add value or streamline your operations. This process is undertaken in collaboration with your team, so everyone is on the same page and working towards the best possible outcome for your business.